More than 650 typical questions related to audits and inspections. Each question with reference to the current EU GMP Guide Part I/II and the 21 CFRs 210/211/11. Your perfekt working tool: compact and practice-oriented! This convenient document contains in-depth background information about planning for and carrying out audits. With more than 650 questions typically asked during audits or inspections, the questionnaire is arranged by subject-matter. Both parts of the book prepare you in an excellent way for audits (internally and externally) and inspections. The section of the corresponding GMP guidelines is quoted next to each question. This way the background of the question and possible answers can be easily researched in the original guidelines and laws. The questionnaire is a catalogue of typical general questions, which may be asked during an inspection. 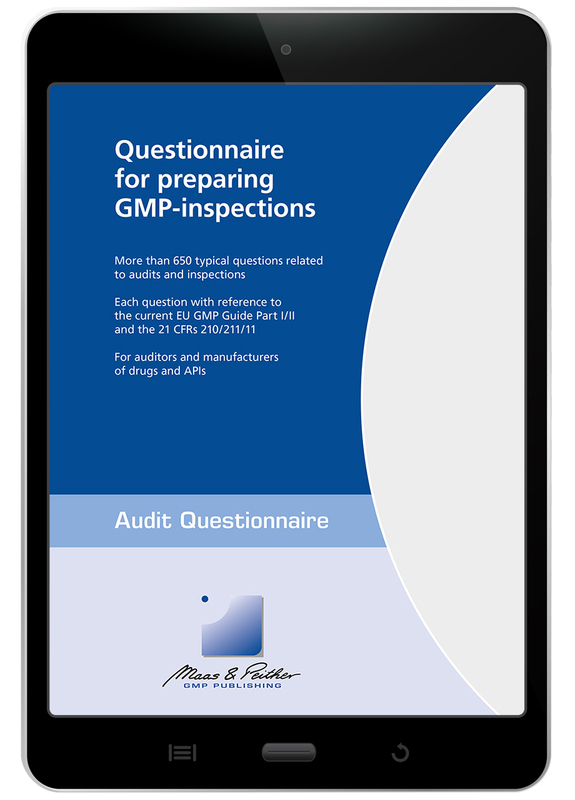 The questions are referenced to the corresponding GMP regulations. In cases of doubt, the relevant original text can be quickly found. Now modifiable: Print your checklist out, delete redundant sites or add new sites – use the document in your own convenient way. your own GMP audit of suppliers and subcontractors. A perfect workingtool in a compact format with a plenty space to write down your notes. Reading Sample "Questionnaire for preparing GMP-inspections"
This file is in PDF and Microsoft Word „.docx" format! After payment is received an email will be sent with the download information. You will receive immediately after the credit card payment an email with the download information.